Right hook bicycle collisions are one of the most common types of bike crashes, particularly in busy urban or suburban areas. Right hook collisions occur when the bicyclist and the motorist are traveling in the same direction with the bicyclist positioned on the roadway between the motor vehicle and the curb. The "hook" causes a bicycle accident in two ways: First, the motor vehicles turns right into the path of the bicyclist and the bicyclist cannot stop in time and collides with the motor vehicle. The second way a bicycle accident occurs is when the motor vehicle turns directly into the bicyclist and strikes the rider. The Illinois Bicycle Lawyers of Keating Law Offices successfully resolved a case on behalf of a Chicago bicyclist who was injured in a right hook collision on December 15, 2012. The bike accident occurred at the intersection of Walton Street and Wells Street in Chicago's Old Town neighborhood. In this case both the bicyclist and the motorist were traveling eastbound on Walton Street alongside one another. Without warning, the motorist suddenly attempted to make a right turn onto Wells Street, striking the bicyclist. This impact threw the bicyclist onto the hood of the motorist's vehicle before the rider crashed to the ground. Following the collision, our client did not seek immediate medical attention, hoping to naturally recover from his injuries over his Christmas break. However, when his pain did not subside naturally, he visited a primary care physician in early January of 2013 and was diagnosed with several muscoskeletal injuries and a left leg wound. In addition to his physical injuries, the bicyclist missed multiple days of work while recovering from his injuries, his Lotus Special bicycle was badly damaged, and he was forced to take nearly a month off from bicycling and engaging in his usual workout schedule. 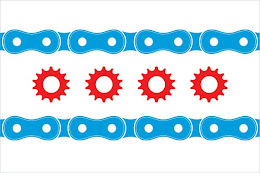 Under Section 5/11-703(d) of the Illinois Vehicle Code, a motorist is required to maintain a safe distance of at least three feet when passing a bicycle proceeding in the same direction. In negotiating a favorable settlement of this claim, the Illinois Bicycle Lawyers emphasized the motorist's violation of this statute in addition to the motorists failure to "keep a proper lookout," legalese for watching where you are going. A very favorable settlement was reached on the injured bicyclist's behalf. The bicyclist was fully compensated for his injuries, medical expenses, property damage, lost wages, and inability to engage in his usual activities. This inability to engage in one's usual activity is called "loss of a normal life." This doesn't mean that someone is totally disabled, it simply means that a person's life is thrown out of whack for a time while they recover. "Loss of a normal life" is fully compensable under Illinois law. It is very important when working on resolving a personal injury claim stemming from a bicycle accident that ALL chances of receiving compensation from an insurance company are pursued. The attorneys at Keating Law Offices always make sure that they do every single thing possible to maximize the financial recovery for the victims of bicycle accidents that the firm represents. If you have been injured in a bicycle accident or collision in Illinois, it is important to consult with an attorney. Keating Law Offices offers free, no obligation consultations to injured cyclists. If you have any questions regarding this post or an issue involving Illinois personal injury law, please contact Illinois Bicycle Attorney Mike Keating at 312-208-7702 orMKeating@KeatingLegal.com 24 hours a day, 7 days a week. All e-mails and phone calls are returned promptly.